Jordan condemns Israel's deployment of troops and police at the Temple Mount, claims Israel violated international law. The Temple Mount became Jewish again on Tuesday, and Jordan didn’t like it. Muslim worshippers, who often harass Jews on the Mount, were not allowed in because police and the Israel Security Agency (Shin Bet) had received intelligence about “malicious intentions” and Islamist incitement calling on Arabs to riot and prevent the Jews from entering. The Jordanian Minister of State for Media Affairs, Mohammed Momani, slammed the Israeli act, which he said aimed at granting access to extremist Jews into the holy mosque. Momani warned that such actions would drag the region into a dangerous religious conflict. Jordan, in its capacity as guardian on holy places in Jerusalem, will continue to use all political and legal means and address all peace-loving people in the world to repel the Israeli aggression against the holy sanctities, the minister asserted, according to Petra. He called on the international community and international organizations to take action and pressure “the Israeli occupation authorities” to stop violations against the holy places in Jerusalem and prevent extremists from entering the Al-Aqsa Mosque. In March, two Arab rioters were arrested for attempting to attack MK Moshe Feiglin (Likud) as he visited the Temple Mount. Jordan ignores the Arab riots and Tuesday’s condemnation is not the first time that it has blamed Israel for “provocations” on the Temple Mount. In April, Jordan summoned the Israeli ambassador to the country to protest the “Israeli provocations” on the Temple Mount. 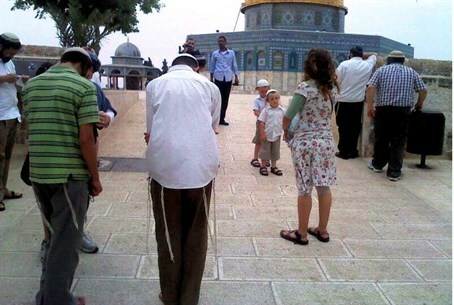 This took place after Israel closed the Mount to members of the Waqf as a result of riots by Arab youths. Several days earlier, Jordan urged the United Nations Security Council to end Israeli "escalation" at the Temple Mount after it was opened to Jewish visitors. Previously, Jordan threatened to revoke its 1994 peace treaty with Israel over a historic debate in the Knesset about providing full religious freedom at Judaism's holiest site.